Since Malone celebrated its 125th anniversary in 2016, President David King has annually engaged his passion for cycling to garner additional scholarship support for current and future Malone students. The 2018 Pioneer 100 was a record-breaking initiative in many respects, drawing nearly $60,000 for the first time. On September 29, in conjunction with Homecoming festivities, King rode a metric century (100 km, or 62mi) on his bicycle throughout Stark and Wayne counties in hopes of raising $1,000 per mile. During the 2017-18 academic year alone, Malone University devoted more than $19M in financial aid to the student body. More than 95% of students received some form of aid. “Financial investment in our students is one way we can ensure that Malone students are enrolled based on their ability to be successful in our transformative, faith-integrated environment rather than their ability to pay,” King said. 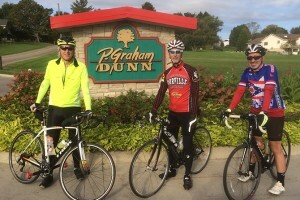 He was joined by his brother Stan King of Orville and Jim Smith of Columbus for the duration of the ride. In the cycling tradition, additional riders, or domestiques, serve as moral support so the primary rider can focus on the finish line. These and other friends of Malone made the 2018 Pioneer 100 a tremendous success, exceeding 2017’s giving by more than $55,000. Of the $59,791 raised to date, at least $33,459 represents brand new gifts to The Malone Fund. 58% of donors gave more to the 2018 Pioneer 100 than their total unrestricted giving last year. Eleven corporate and partner sponsors were joined by University trustees, alumni, friends, employees and other members of the Malone community in support of Dr. King’s effort on students’ behalf. The initiative is not yet closed and only $2,200 remains to meet the $62,000 goal. Contributions can still be made at www.malone.edu/pioneer100.